Almost 400,000 Soldiers of Chaos descended on New York City over the weekend to ostensibly demand the US do something about climate change. What a load of bull crap. And someone (I hope) is checking those attendance numbers, because as we all know, these jack wagons literally aren’t capable of telling the truth. Behold the brown green shirts who are Marxists, Communists, Socialists, Progressives, Islamists, radicals… They all want to transform America into some form or other of a hellish tyranny that benefits a few and suppresses the rest. They call themselves the People’s Climate March, but they are nothing more than commies wearing green as an excuse. 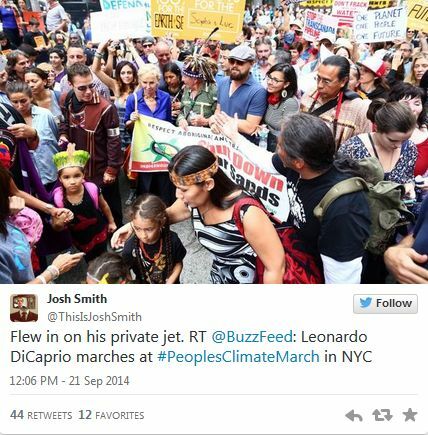 The march was orchestrated to push the UN Climate Summit on Sept. 23. Every radical and moonbat on the planet was there it seems. 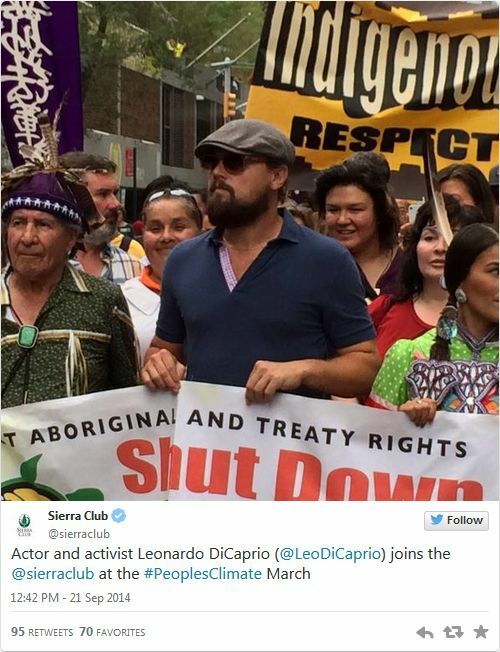 Of course, UN Secretary General Ban Ki-Moon took part in the two-mile march through the streets of Manhattan, along with musician Sting and actors Leonardo di Caprio and Mark Ruffalo. Former vice president Al Gore and New York Mayor Bill de Blasio were also goosestepping to the fascist tune of the global elite — hell, they’re part of them. The New York event was the largest of 2,646 events taking place in 156 countries, according to organizers (if you can believe lying liars). “We said it would take everyone to change everything — and everyone showed up,” said Eddie Bautista, executive director of the New York City Environmental Justice Alliance, in a statement. Of course our ‘selfie President’ will attend the UN conference. Although there is incontrovertible proof that there is no global warming and this global climate change garbage is nothing but an attempt to further communism and force subjugation on the masses, these evil asshats just keep on trying to breathe new life into this dead horse. They just won’t stop and evidently they have found enough useful idiots to make propaganda globally and loudly. Maybe it’s a new union for the evil out there organizing on earth for those stopping over on their way to hell. There won’t be much green there, but oh, the weather is to fry for! So, Obama and his minions presented last week, in preparation for the Climate Summit, the US outline for its plan that applies to a possible global climate agreement. The Summit is seen as a key milestone on the path to an agreement. Yeah… not that Americans will have any say or anything. You can count on that – like it or lump it will be Obama’s edict. Obey if you know what is good for you, or else. The usual limited subset of the craven, lap dog media are promoting this ad nauseum. The New York Times is elated and demanding change right now, damn it! What a bunch of illiterate, self-loving, sycophants. I won’t even quote them as it was lie after lie after lie in their propaganda spread. Wretch worthy. What was of note, which the NYT called diversity, was the vast array of nut jobs and radicals that attended the event. Every hate-filled freak that could slither there on their belly showed up for the party. Picture a minaret of an inflatable mosque, floating serenely next to Noah’s Ark on West 58th Street. Then you had Capuchin Franciscan monks decked out in flowing brown robes and nuns marching to the Marxist tune of ideologies that are totally incompatible with Christianity and most other religions. But they snuggled right up to those flying a pagan flag and beating a drum. I’m sure the Satanists and Anarchists were there too. At Columbus Circle, there were bare-breasted women and people with dreadlocks and handmade clothing. There were Muslim women wearing hijabs and groups of older women with signs proclaiming they were “Grandmas Against Global Warming” and that “Gray Is Green.” Some of these people need serious, long-term care and help. Really. This is theater for the very, very stupid. The majority of Americans know this and just try to ignore it. The problem is that these nincompoops have managed to insert themselves into positions of power and what they do directly effects all of us in every area of our lives. John Kerry is in the thick of it, working tirelessly to destroy America, tax us to death and force us into a dictatorship. He should have stayed in Vietnam. Just sayin’. The march was replete with celebrities. Twitchy rightly mocked Leonardo DeCaprio. Robert F. Kennedy Jr. also lost it at the March when confronted by PJ Media’s Michelle Fields about being a hypocrite. Truth hurts. Sadly, we can’t just afford to laugh off these loons. Their agenda is a massive wealth transfer. 47 different groups there had ‘justice’ in their names. Justice and equality have nothing to do with this. It’s straight up communism. It’s about taking from those who have earned it and giving it to everyone else – forcibly. William Teach put it superbly when he said that Sunday’s NYC Climate March is like totally anti-establishment, man. Totally. Although almost 400,000 protestors showed for Sunday’s festivities, guess who didn’t? Most of the media. The NY Times, LA Times, Washington Post, CBS News, ABC News, Chicago Post, Miami Herald, USA Today and a whole slew of NY papers were missing in action. You know why? Because this is lame, trite propaganda and Americans are bored and pissed by it. Anti-establishment unless of course you count that all of these groups and individuals are intricately linked to the Democrat Party… such as SEIU, the Teamsters, League Of Women Voters, College Democrats of Mass, CWA, Audubon Society, National Lawyers Guild, NOW, tons of unions, including teacher’s unions, and a whole raft of others, all Left leaning. Then there’s the tried and true Socialist and Communist groups involved, plus CAIR, Code Pink, Common Dreams, World Can’t Wait, MoveOn.org and all the other Democrat voting wackadoodle groups one would expect as Teach aptly stated in his article. One moonbat had a sticker that said, “Capitalism is destroying the planet… We need revolution, nothing less.” Printed on green, which of course, is the new red. Other activists were chanting, “F*ck the police!” Not sure what that has to do with climate change, but it sure plays into the chaos theory. And in a “I don’t think this word means what you think it means” moment, individuals with the socialist newspaper “The Militant” were selling newspapers to attendees, while Occupy Wall Street members asked for “donations” in exchange for shirts. So, you are anti-capitalist, but only when it suits you? Yep, the very definition of hypocrisy. 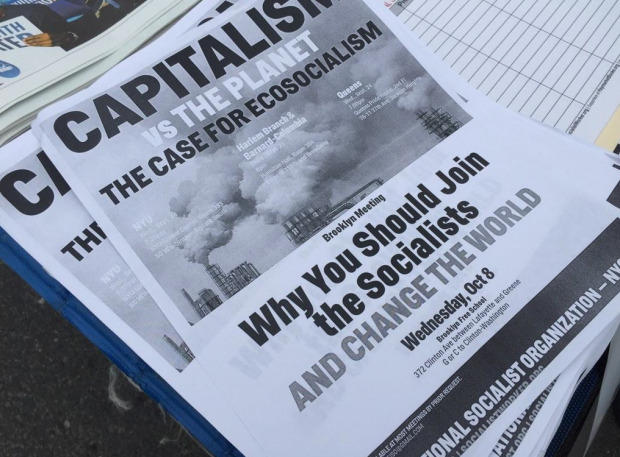 Not to be left out, members of the Socialists Workers Party also manned a table, passing out flyers attempting to make “the case for ecosocialism.” You say tomato, I say communism. Meh. Welcome to Climate Week in the rotten Big Apple, featuring celebrities, CEOs and climatologists. The Soldiers of Chaos march forward in America to bring devastating change upon us.